Frequently Asked Questions about Evolis Card Printers ID. Evolis Plastic card printer frequently asked questions. Tap into our collective knowledge base. 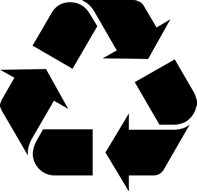 Have cartridges made from recyclable ABS plastic, the cases of the printers are recyclable and low power usage of the printers means less electricity being used. Advanced power states allow for even further savings. With our trade in promotions we strive to not to create more pollution for future generations. Printers are stripped down to components and separated into what can be recycled and what cannot. Can I share my printer on a network? The Evolis Printers are available with an Ethernet port to allow you to connect the printer directly to your network. This means that you can connect a printer directly to a network port and the printer is available to the computers on your network. The printer has an on board memory that will store print jobs allowing you to allocate print runs and the printer will process them one by one. Handy when multiple computer stations need to send print jobs. These printers have been used in registration booths where multiply kiosks complete registration and a card is issued at the end. In Microsoft Update KB4041676 released in October, 2017, Microsoft decided to remove from your computer the MS-Excel 95-2003 database provider, without your prior consent. As a consequence, eMedia Card Designer, as many other programs, cannot access to MS-Excel 95-2003 datasheets anymore, as eMedia Card Designer only uses standard components to access to databases in order to comply with Industry Standards. To access to your MS-Excel 95-2003 datasheets, you will have to change the database connection in your card template. Open the "Tools" menu, select "Database connection". Instead of "Microsoft Excel 95-2003 datasheet", select the "Microsoft Excel 2003-2010 datasheet" and click "Next". In the database field, click on the button to select files, and at the bottom, replace in the "File types" combo-box the default choice (XLSX files) to "All files". Browse to the folder containing your XLS file and select it. That's all, it will work again! How many printers can I connect to a computer? It is possible to connect as many printers as there are ports available on your computer. It will sometimes be necessary to rename the subsequent printers to prevent confusion. Can I upgrade my printer? Are there tools available for my printer? Upon request software tools are available. The Evolis SDK allows for custom applications to be developed. InteractCard are a certified Evolis Repair Centre. Our staff are trained and skilled in the uses of ID Card Printers. InteractCard carry spare parts referenced by Evolis for repairing the printers. Can I print smart contactless cards? Yes, you can print on smart cards without contact. There are various proximity solutions available. Printing on contact-free smart cards is performed in the same way as with standard cards. Certain aspects of the card must be taken care of for a correct printing result. In fact, the flatness of the card in the position of the chip and the aerial must be perfect. If not, the smallest surface fault will be visible in the printout. The Evolis Printers can have various encoder modules installed, smart, contactless and Magnetic stripe can be installed in one printer. Contact us for more information on identification solutions with Smart card or Contactless smart cards. How do we print on smart cards? The main consideration in the card design is to omit an area on the card where the chip is housed. The printer driver has a setting for Smart Cards that apply the overlay around the chip. Can you encode Magnetic Stripe? Current Zenius Expert, Primacy can be upgraded to have a magnetic encoder fitted. Can I encode anything other than ISO format? All Evolis printers fitted with a magnetic encoder are set up to be able to encode data in standard ISO format. Using the driver parameters, it is possible to encode all kinds of data in a Hexadecimal code or different ISO formats. With ISO type coding, what is the format of the encodable characters? My magnetic cards did not encode. Check that the information to be encoded is in the right format for the track it is being encoded to. Also check if your card stock is either HICO or LOCO and set the driver to the appropriate setting. What are the characters at the beginning and end of the magnetic encoding chain? These are known as 'Sentinels'. They indicated to the software driver where the data begins and ends. Is it possible to re-read a magnetic card that has just been encoded? It is entirely possible to reread a magnetic track that has been encoded by an Evolis printer. When the encoding card is reinserted in the loader, you must open the printer properties then click on the Tools tab. With the Zenius Expert and Primacy the encoding tools are located in the Evolis Premium Suite. What is Thermal Transfer / Dye Sublimation? Sublimation enables colour printing with 5 or 6 panel ribbons. Heat transfer enables single colour printing in black, blue, red, green, white, gold or scratch. Dye Sublimation is the process where the print head heats up the ribbon to such a temperature that it melts the colour into the plastic media. Thermal Transfer also uses heat but only enough to melt the ribbon on top of the media. What is the printer print resolution? The majority of Evolis printers have a resolution of the print head of 300 DPI, which gives a printing possibility of 12 pts per millimetre. This resolution is fine for printing photos and other visuals, whether it be in colour or black and white. The Avansia card printer is capable of printing 600 dpi. What kind of media can I print on? All Evolis printers have been developed to print in sublimation and heat transfer on a laminated PVC support. Under certain conditions, it is possible to use other materials, for instance, the R2229 & RCT019NAA heat transfer black ribbon enables the use of paper cards. How can I tell how many cards I have printed? In the driver settings it is possible to print a 'Technical Test Card' which shows how many cards have been put through the printer and how often it is being cleaned. How do I print a test card? 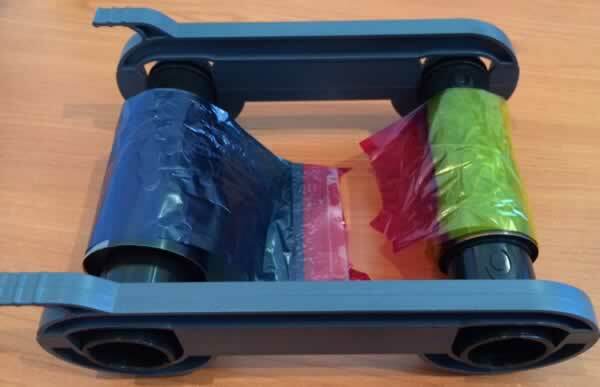 Check if a ribbon and card are loaded inside the printer. In the Evolis Premium Suite go to 'System Details' -> 'Testing Cards' Choose either 'Graphical Test card' or 'Technical Test card'. The tech card will show how many prints and cleans the printer has done. With older printers, Open your Printers and Faxes folder and right click the properties of your card printer. 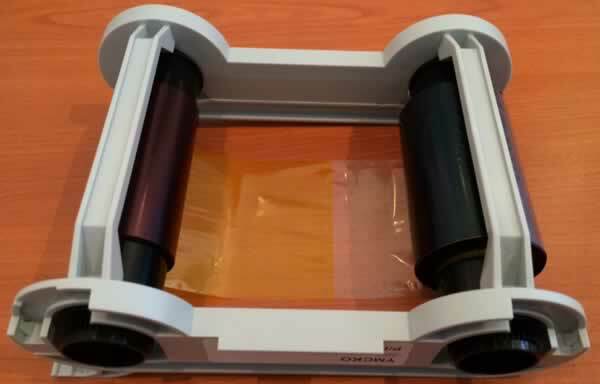 If you happen to experience a torn ribbon it is most likely that you need to clean your printer. The ribbon can still be used. Just tape the ends back together and you can still print. Just tape the torn ends back together. How do I print on both sides of the card? Depending on the printer model it is possible to print on both sides of the card automatically in the driver setting. Otherwise with simplex printers the operator will need to manually flip over the card to print on the back. Can I print on non-ISO format cards? The accepted format for printing cards is mainly ISO CR80. Under certain conditions, it is possible to use cards with a particular format (hole punch cards, cards in the shape of a shoehorn, ...). To confirm the working of these cards, send a minimum sample of 50 to us, as well as technical specifications describing the type of printing required. Evolis will confirm or reject the feasibility of the card printing. The Evolis printers have a Software Development Kit available upon request. What barcodes types are supported? The printer will print what has been sent to it as a print job. The barcodes are generated by your application, the printers can print any that come from this application. It is not the printer that restricts the printing of a barcode, but rather its availability of the barcode font in the font library. Why is there a white line on my printed card? Make sure your printer head and printer are clean. Cleaning kits are available here. Evolis designs, manufactures, and markets a comprehensive range of printing systems and plastic card personalization solutions. Plastic cards are used everywhere, for ID badges, payment cards, transit passes, access badges, loyalty cards, student ID cards, national ID cards, and so much more. Evolis' goal is to make plastic card printing widely available, offering cost effective solutions for printing high quality cards easily, quickly and on the spot. electronics (contact and contactless RFID smart cards). Evolis is now ranked as the market leader in Europe and number 2 worldwide. Our expertise is recognized by systems integrators, key accounts and end users for a wide variety of projects. You too can benefit from our leadership, our proven solutions and our international expertise.